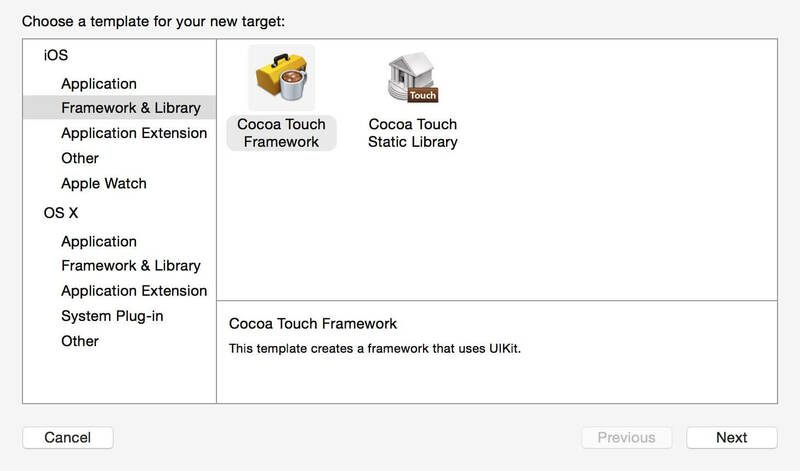 iOS 8 provides an easy method for extending the presence of your existing applications. App extensions were introduced as a way to extend the functionality and content of your application to other applications or the system. This article describes how easily a particular type of app extension, the Today Extension, can be incorporated into an existing application, giving the application new life. Note: Swift will be the language used in our code samples. For the Product Name field, enter SurfcastServices. In the navigation section in Xcode, you should now see a new folder with the title SurfcastServices. You can add classes for performing activities common to both the main application and the extension. 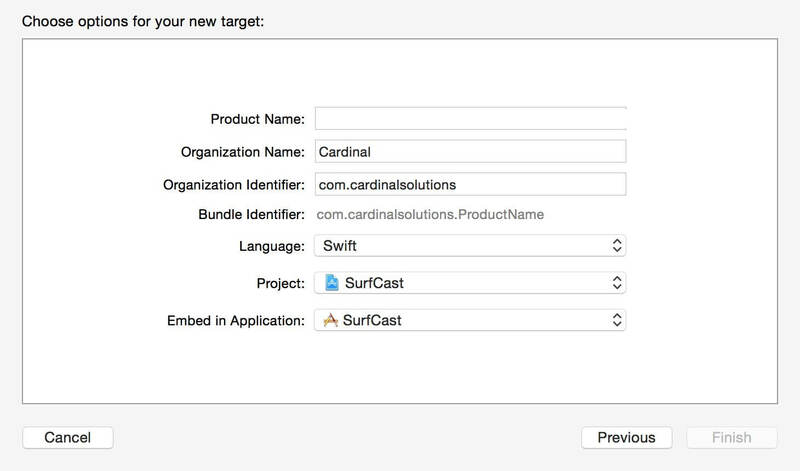 This time for Product Name, enter Surf Cast. This name will be used as the name of the app in the Today view. You may get a follow-up dialog asking you to activate this scheme. Make sure you select Activate. As you can see, not much is going on here. TodayViewController extends UIViewController, so the familiar lifecycle methods, such as viewDidLoad, are available. 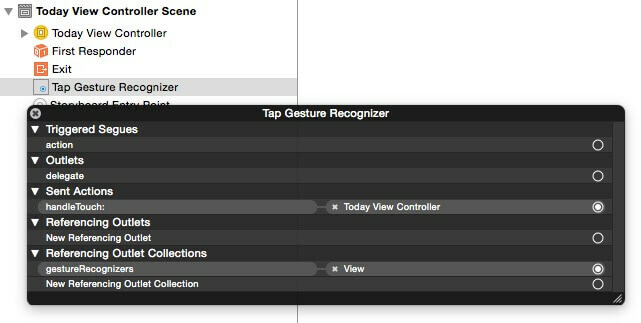 Also notice that TodayViewController implements the NCWidgetProviding protocol. This protocol provides the method widgetPerformUpdateWithCompletionHandler. This method is called by the system, either in the background or in Notification Center, to allow the extension to updates its contents. All updates should be done asynchronously in this method. When complete, this method should call the completionHandler block passing in the appropriate NCUpdateResult (.Failed if the update failed, .NoData if no new data was gathered or .NewData if new data was gathered). 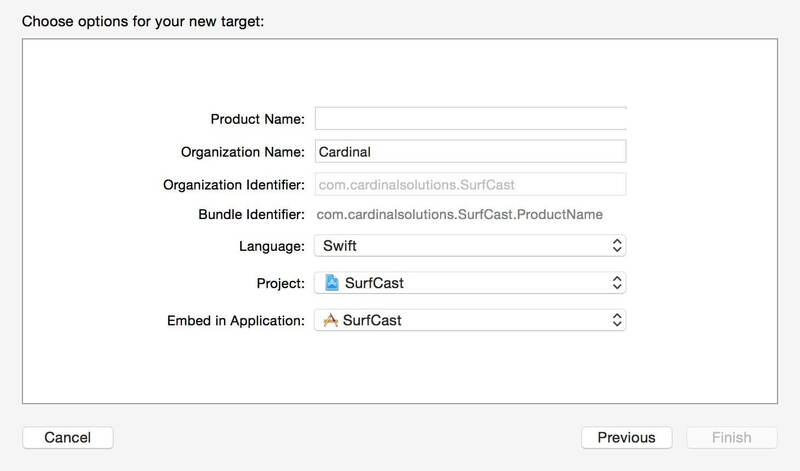 Later, we’ll add calls to our SurfcastServices framework classes to this method. As with other storyboards, it's best to use autolayout to define the appropriate constraints. Most of the elements in this storyboard are standard UIImageVIew and UILabel components. 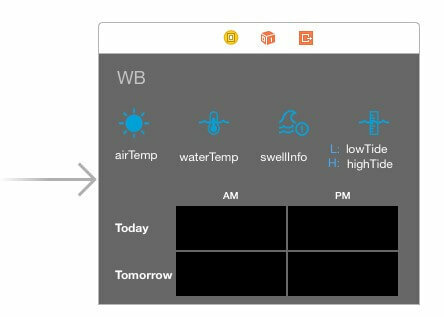 The black boxes, however, are subclasses of UIView called ForecastView. This special subclass is passed a condition and swell size. 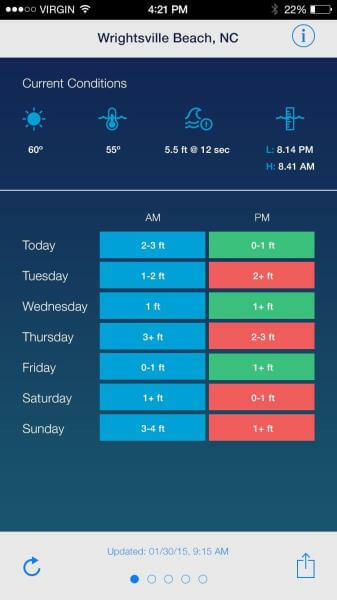 Given these two values, the view will create a color gradient representing the surf conditions (green = clean, red = choppy, blue = fair) and a numeric indicator of the swell size. The implementation for this class isn't discussed here, but we'll see it in action a bit later. @IBOutlet weak var surfLocation: UILabel! @IBOutlet weak var airTemp: UILabel! @IBOutlet weak var waterTemp: UILabel! @IBOutlet weak var swellInfo: UILabel! @IBOutlet weak var highTide: UILabel! @IBOutlet weak var lowTide: UILabel! @IBOutlet weak var todayAMView: ForecastView! @IBOutlet weak var todayPMView: ForecastView! @IBOutlet weak var tomorrowPMView: ForecastView! @IBOutlet weak var tomorrowAMView: ForecastView! 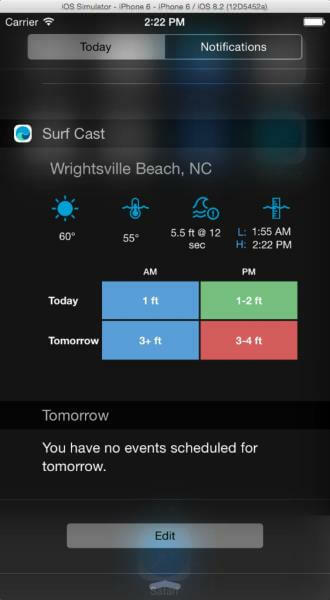 The getForecast method returns a SurfForeCast instance for the given surf break — in this case, Wrightsville Beach ("WB"). The values for this instance are then used to populate the labels and ForecastViews in the storyboard. // Perform any setup necessary in order to update the view. 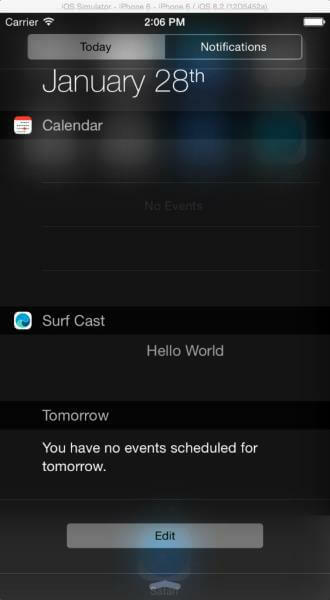 Now, when you run your Today Extension, tapping anywhere in the SurfCast view should take you to the full application. That was actually pretty easy. With very little effort, you can extend the life and presence of your existing iOS applications. 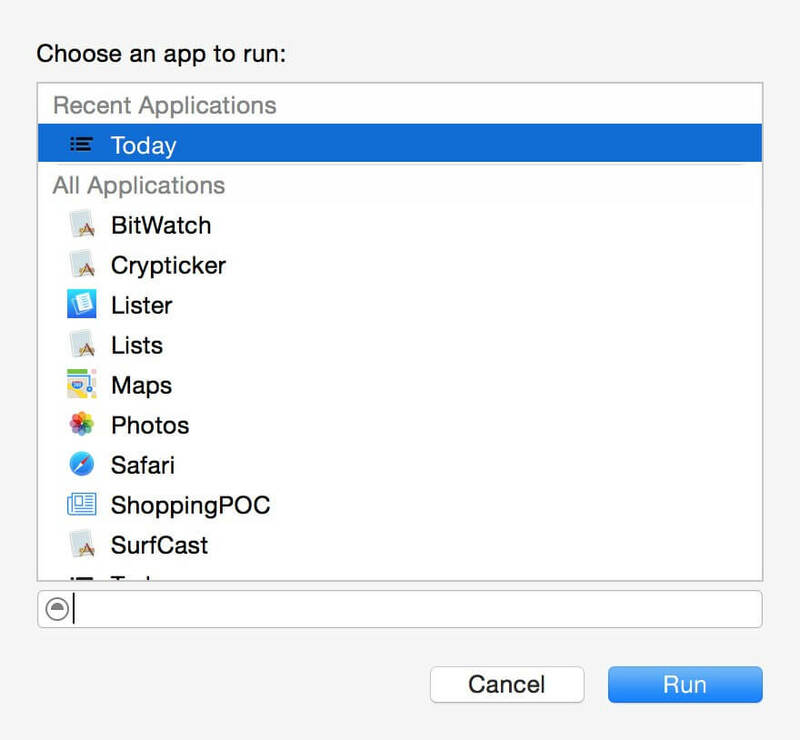 The Today Extension is but one of several extension types provided in iOS 8. 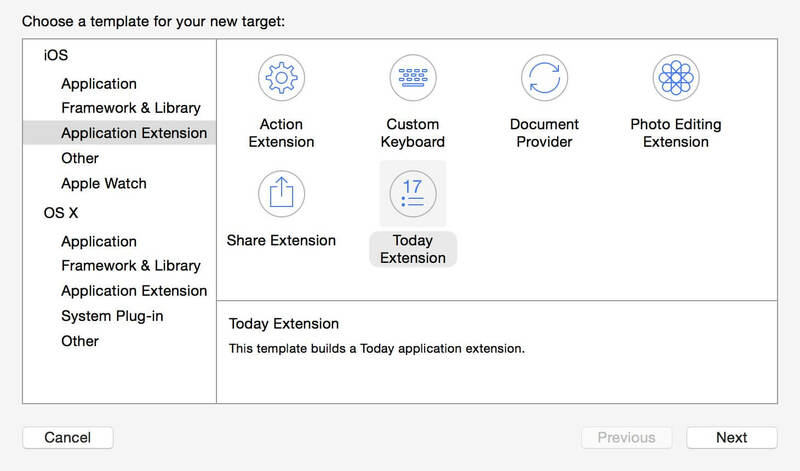 The other extension types can be found on the Apple developer library document "App Extension Programming Guide." This article originally appeared on April 28, 2015.